World Animal Day takes place every year on October 4th (to correlate with Feast Day of St Francis of Assisi, the patron saint of animals). 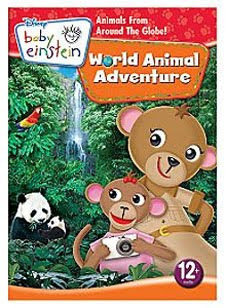 We're celebrating a couple days late this year by watching the new Baby Einstein: World Animal Adventure DVD that was just released on September 29th. Humorous animal puppet skits and images of toys and objects break up the segments of the real-life animals. The video closes with a world animal song featuring children moving and dancing like the animals. The DVD includes play modes: Two "Grow with Me" Viewing modes and "Select a Segment" (allows viewing of shorter segments or just the puppet shows). Bonus materials included consist of "Discovery Cards" (a mommy/baby animal slide show), World Animal Song video and a Toy Chest showing toys from the video. The main feature runs about 35 minutes. Baby Einstein videos encourage interaction between parent and child. In my opinion, this type of DVD works best when parents sit with their children, provide commentary and reemphasize the concepts, just like if they were reading a picture book together. I like viewing mode 2 over viewing mode 1, though the differences are minimal. Intended for toddlers and kids, the "Grow With Me" viewing mode (#2) offer the text and action words along with the images, instead of just visuals and music and animal names. The puppet shows, especially the segment with the sneezing zebras, were a hit here. The music accompanying the sequences is rather unmemorable, but does try to incorporate ethnic rhythms and sounds suitable for each region. I really like the option allowing viewers to watch only the puppet shows. However, it surprised me that you can't choose to just watch one continent segment at a time, because the DVD might be useful if an educator wanted to show specific location segments while teaching about one world locations like South America. I found it slightly annoying that all the animals shown weren't named. The world animal song featuring the children dancing engaged my kids and they happily danced along. If you are going to buy or watch a Baby Einstein video for the first time, I recommend selecting one featuring animals because my kids seem to like the animal Baby Einstein DVDs the best. They greatly prefer World Animal Adventure over World Music, the DVD released earlier in the year.